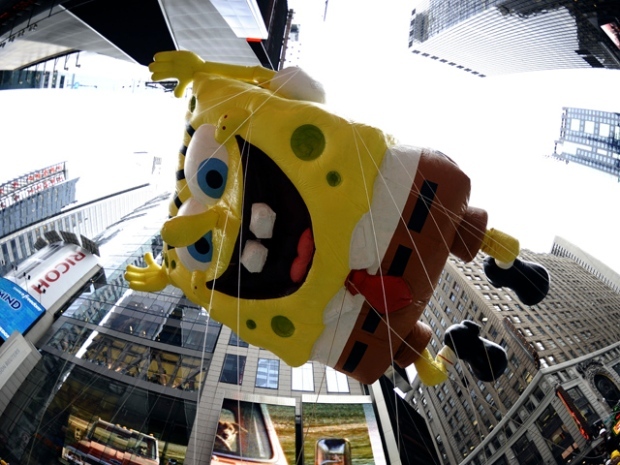 A high-kicking Kung Fu Panda and a diary-toting Wimpy Kid joined the giant balloon lineup as the Macy's Thanksgiving Day Parade unfolded Thursday, drawing tens of thousands of spectators to the annual extravaganza on a chilly, overcast morning. Emily Rowlinson, a tourist from London, squealed and snapped pictures with her cell phone as the massive Smurf balloon floated by a packed sidewalk along the route. As millions more watched the live broadcast on television, revelers gathered nationwide for other parades in cities such as Detroit, Chicago and Philadelphia. Entertainers on tap in New York included Kanye West, Gladys Knight and Colombian rocker Juanes. The Broadway casts of "American Idiot'' and ``Elf'' performed, along with marching bands from across the United States. Perched on her father's shoulders, 16-month-old Stella Laracque wriggled and danced with excitement as SpongeBob SquarePants, Hello Kitty, Shrek and other beloved figures wafted past her. "She doesn't really know the characters, but she's loving it,'' said her father, Mike Laracque of Manhattan. And, as always, there was a Santa Claus in the parade. A huge cheer erupted as he passed by a crowd gathered about midway along the route. Other celebrities at the parade include India Arie, Keri Hilson, Arlo Guthrie and Miranda Cosgrove. "She's a famous person, and I always see her shows,'' Melissa explained after the actress-singer passed by on the Build-A-Bear Workshop float. The Macy's parade started in 1924 when employees from the department store marched in costume from Harlem to Macy's flagship store on 34th Street. The parade was suspended from 1942 to 1944 because rubber and helium were needed for World War II, making Thursday's parade the 84th. 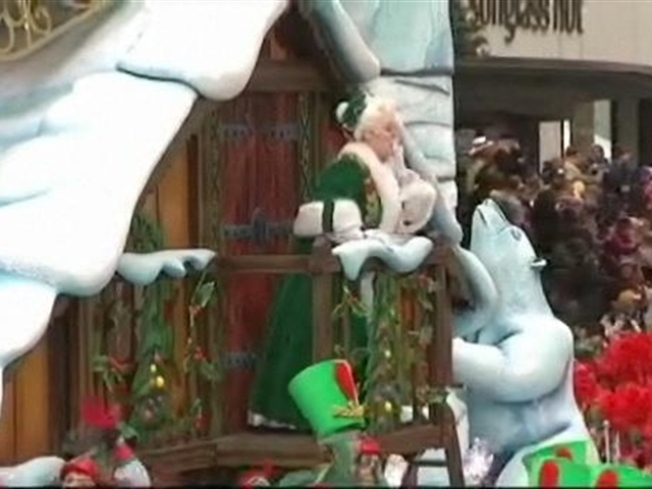 The parade followed the route it inaugurated last year, starting on Central Park West and proceeding down Seventh and Sixth avenues to 34th Street. The route had to be changed when vehicles were banned from parts of Broadway. Workers had removed street lights and traffic lights to make way for the massive balloons and were standing by to replace the equipment. "As soon as Santa Claus drives by, the poles go back up,'' said Tom Carola, a worker with an electrical-contracting company hired by the city. In Detroit, a morning drizzle and chilly temperatures weren't enough to keep John and Matt Fisher from attending that city's parade. The father and son from Hamtramck, Mich., had their RV set up a day ahead of time and by Thursday morning had a prime spot for watching it _ equipped with coffee, hot cocoa, soup and chili dogs. A block away, a German exchange student was watching his first Thanksgiving parade. "This is great,'' said Jonah Boyd, 16, of Hamburg, who didn't know much about the American holiday before arriving in South Lyon, Mich., where he is staying with a host family. "All I knew was that people ate turkey.'' Before the race, Boyd, his girlfriend and her family watched thousands of runners take part in the annual Turkey Trot race. A similar race in Buffalo, N.Y., attracted more than 12,000 runners, the most ever in the event's 115-year-history, organizers said. Many participants in Detroit wore costumes: One ran in a Santa suit, complete with sack. An elf was spotted as well. Others were wearing Halloween-type outfits, including runners dressed as Iron Man and Captain America. Perhaps the most appropriate attire belonged to the two Turkey Trotters wearing turkey hats.